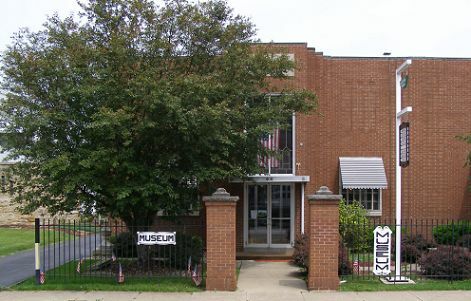 The Crawford County Illinois Historical Society Muesum and its associated library contain thousands of artifacts -- any material which may help to establish or illustrate the history of the area and the diversity of its people, such as diaries, rosters, photographs, business and school records, furniture and belongings owned by Crawford County pioneer families and documents dating back to before the 1816 chartering of Crawford County. The library includes regional newspapers from the past -- clippings and photographs, plus genealogy material, and cemetery records, to name a few. Our library and website not only provide information for those working on genealogy, but are also helpful for students participating in the Crawford County and State History Fairs. The museum is just a great place to tour and spend an interesting afternoon. The website provides online access to selected material taken from our museum and library, in the forms of scans or photographs of physical artifacts, transcriptions of articles, and lists of names and events. The first Crawford County Historical Society was organized on February 23, 1925 with C.B. Mount as President; Mrs. J.A. Ikemire, Vice President; Rev. E.H. Glifford, Secretary; and Mrs. Manford Cox, Treasurer. Plans for representatives from each township were made and surveys of Medical, Legal and Educational activities were made. The collection of historical artifacts and documents were considered, said articles to be placed in the community building at Leaverton Park in Palestine. Due to a lack of funds and a location to house a collection of historical artifacts and documents, it did not long survive. Nothing more was done until 1967 when Maurice Batman suggested that a new society be organized and the first meeting was called by Doris Davis and was held in the community room of the Crawford County State Bank. Bayard Heath was elected President; Morgan Newlin, Vice President; Dorthe Wilkin, Secretary; and Carolyn Colliflower, Treasurer. Board Members were Guy Tomlinson of Oblong, L.E. Seitzinger of Flat Rock, Agnes Smith of Robinson, Max Thompson of Palestine and Irene Trimble. Dues were set at $1.00 per year, and after an intensive membership drive, 583 members were registered. Efforts were made to secure the John Hill property located at the comer of East Walnut and South Lincoln Streets, Robinson and the I.C. Railroad Station on South Cross Street; however, neither effort was successful. In 1972, Marjorie Illyes talked with Chancellor Spencer of E.I. College District and Dr. Joe Piland, President, Lincoln Trail College, for a lease on one of the temporary class buildings that had been vacated on the completion of the permanent Lincoln Trail College buildings. Billy Bachelor was the President at this time and through his efforts and the hard work of the board, the Museum was opened at Lincoln Trail College in January of 1975. In 1987 we were told we had to vacate the building at Lincoln Trail College within 90 days. The museum contained rooms full of history and there was no place to move or store the contents of the rooms. Fortunately the new President of Lincoln Trail College, Mr. Donnay, as well as Chancellor Smith of E.I. District agreed to a 4 year renewable lease. In 2006 the Lincoln Trail Foundation sold to the Crawford County Historical Society for a very small amount, the former Schmidt Clinic located on South Cross Street. This move allowed for the display of artifacts in individual rooms by category such as; Education, Military, Heath Candy, Arts & Music; displays of typical rooms of the past, as well as a conference room, research library, office, and much needed storage -- fifteen rooms in all. Downstairs also houses the Wabash Valley Archeology Society. The main reception room has rotating displays as well as serving as a place to hold special events. Several of the annual special events are the "Nite at the Museum" during the Robinson Fall Festival, the "Everything Persimmon Bake Sale", a Dulcimer Christmas Concert early in December, the Antique Appraisal Affair, as well as guest speakers. In April, 2013, the museum was able to obtain a replica of Lincoln's casket and featured it along with several displays of information. The casket was again on display for two weeks in Oct. 2014, when over 700 visitors passed through the museum doors. Gustave F. Schmidt Sr., M.D. was born in 1880, retired in 1946, and passed away in 1963. Dr. Schmidt originally practiced on the south side of the Robinson square, circa 1907. A little later the practice was moved to a house at 408 South Cross Street. The present building was built in 1938-39. The 28 bed hospital was a fine addition to the city of Robinson. Gustave F. Schmidt, Jr., M.D., followed in his father's footsteps and practiced medicine from 1933 to 1998. He died in 2004. Dr. Schmidt's second son, Walter F. Schmidt, D.D.S., practiced dentistry from 1934 to 1985, and died in 1991. William B. Schmidt, M.D., born in 1916, joined the Clinic in 1940. He practiced for two years before joining the U.S. Army in WW-II and was honorably discharged in 1946. He practiced medicine until his retirement in 1998. A third generation of Schmidts was William Terry Schmidt, M.S.D.D.S He joined his father, Dr. W.B., in 1976. In 2000 he built the "Smile Center" at 1502 W. Main Street. Many "non Schmidt" physicians and surgeons also practiced in the Schmidt Clinic, including: Dr. Randolph Olmsted, Dr. Charles Maples, Dr. John Hippensteel, Dr. Herbert Iknayan and Dr. Thomas Sloan. From the December 19, 1961 Robinson Daily News: "The Schmidt Clinic here will discontinue admitting patients for hospitalization after January 1, (1962), although all other facilities of the Clinic will be continued as in the past" it was announced today by Drs. Randolph Olmsted, G. F. Schmidt, Jr., and William Schmidt. The Schmidt Clinic will continue to remain open after January 1 to provide offices for the three doctors and out-patient care and diagnostic facilities, including laboratory and x-ray, but will no longer hospitalize patients."